Deb's Cup of Tea: Marty Eastman in Concert! Marty is a friend of mine. His son, Niles, went to high school with my daughter, Carole. He is an exceptionally good guitarist and writes and arranges his own music. Carole and I have been friends with the Eastmans for over 10 years now. It's amazing to think we have known wonderful people like them that long. 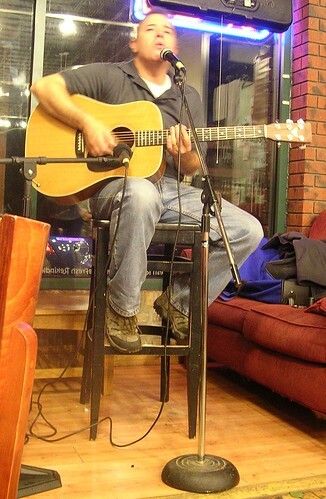 Tonight, Marty sang a variety of songs in the blues and bluesy folk tradition at a local Wheaton coffee shop, La Spiaza. The concert started at 7:30 and there were 5 of us in the audience, including the guy behind the counter. Around 8, more of their friends arrived and, by 8:15, there were a dozen of us enjoying the music. There were a lot of things going on in Wheaton tonight so there weren't more of their friends in attendance, but, you know, that made the night special. Even if you count the performer amongst your friends, where there are a lot of his or her friends in the audience, you can feel as if they are too busy recognizing everyone to say, "Hi! Thanks for coming." The shop is small and a dozen people filled almost all the tables. La Spiaza is well-known in Wheaton as a great place to hang out. I've been there on a few occasions, to meet people or to hang out between events. It was the perfect venue for a bluesy folk concert where you could put your feet up, say hello to people you knew and watch the looks on the faces of the kids who wandered over from Wheaton College to get gelato who realized they were in a room where the average age was older than their parents. I'm very glad I went. It's a slightly rainy evening and, remember, my wipers don't work. But, it's 2 miles to downtown Wheaton and I know all the streets. I got there before the rain and left after the rain. I had a lot of fun. Marty is very funny and the stories he tells about how he got the inspiration for some of his songs are hysterical. So, when he plays the House of Blues in Chicago, I can say, "I was there when he played La Spiaza."